Dr Vijay Malik is a successful stock market investor of Dalal Street. He is also known as Dr.Stock. He is expert in identifying a health of a stock. His investment methodology is named as a peaceful investing. Dr.Vijay Malik has identified several multibagger stocks for investment. Dr.Vijay is a unique combination of MBBS, MBA, CFA, Stock picker, and biker. He is SEBI registered Analyst. Dr.Vijay Malik started stock market investment in 2006. Prior to this, he completed his MBBS from a reputed government medical college in Maharashtra. After working for several years in the medical filed he realized that his cup of tea is finance and not medical. So, he decided to become Dr. Stock.He completed MBA (Finance) from IIFT Delhi in 2011. After completion of MBA, he has done certification like CFA (Chartered Financial Analyst) and Finance Risk Manager. He has developed a unique stock analysis excel tool called as Screener.in. A screener is an excellent tool that creates a dashboard of key analysis parameters for the stock. It will help an investor to make an opinion about any stock in few minutes. Dr.Malik follows fundamental analysis. 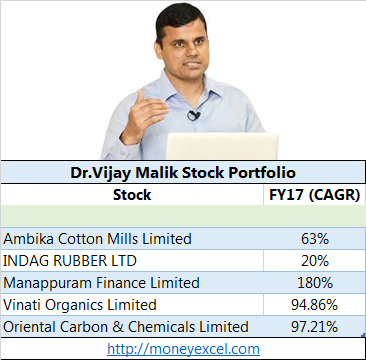 A stock portfolio of Dr.Vijay Malik has generated an annualized return (CAGR) of 73%. During FY2017, his stock portfolio generated a return of 173.55%. In a recent interview of Mr.Malik published in economictimes, it is stated that over last 10 years, Dr.Malik has selected 14 stocks for investment but he has sold 8 stocks from his portfolio. He is only holding six stocks in his portfolio. Every stock of Dr.Malik is a multibagger stock. He has not shared his portfolio anywhere in public domain. However, unofficially from various websites like shareboss I am able to capture Stock holding of Dr.Vijay Malik. If you want to know about his actual portfolio you can subscribe to premium service offered by Dr.Malik. Note – Above portfolio of Dr.Vijay Malik is indicative and may not be correct as on today. If you want to get exact information on his portfolio you can subscribe to premium service offered by him. Dr.Malik follows fundamental analysis rigorously. He always finds stocks with strong fundamental for the investment. He does a complete analysis of stock on key parameters like financials, business, management, valuation before investing in any stock. As per Dr.Malik, a historical performance of stock matters a lot. His excel based tool shows a complete detail of stock in terms of past performance, revenue, profit margins etc. He refers to the historical performance of stock before taking any investment decision. Dr Malik taught investor to stay invested in fundamentally strong stock without any hesitation. He invested in J K Lakshmi Cement stock in Aug 2008 at Rs.40. The stock started declining but he never lost a faith he continued buying the stock. He sold stock at Rs.69 in Dec 2009. Dr Vijay Malik also teaches us to learn from mistakes. He sold L&T at Rs.1506 in March 2007 after purchasing it at Rs.1483. A few days later in Nov 2007 stock was trading at Rs.4500. Mr.Malik realize his mistake and decided to relook at his investment strategy. He decided to study further on perfect entry and exit points on the chart. Mr.Malik respect other stock market veterans and follow them. He shared that writing of Peter Lynch and Warren Buffett helped him to improve understanding of fundamental and cash flow analysis. Dr Vijay Malik says that company management is a mediator between the profits of the business and junior shareholders. A quality and Integrity of management is very important. One should monitor every action of management carefully. This will help the investor to be in safe hand. Dr Stock carry out a perfect health check of a stock using his diagnostic kit screener tool before investing. We should also carry out research before investing in any stock. Do you follow Dr.Vijay Malik for stock market investment? Do share your views in the comment section given below. screener.in was founded by Aayush Mittal and not Vijay Malik. I am a Vijay Malik fan though. I would like subscribe premium services offered by Dr Vijay Mallik. What’s procedure?